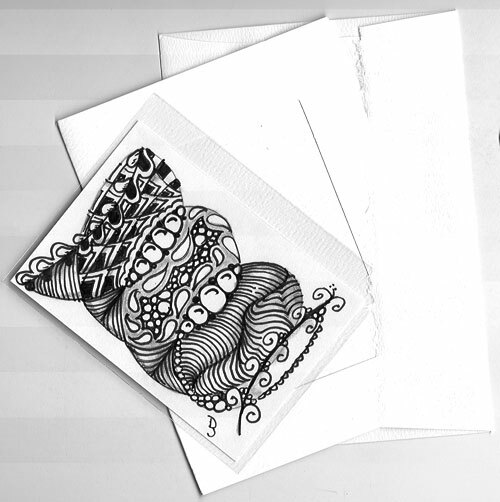 I recently joined a group of individuals who share Zentangle-inspired art through the mail. Similar in concept to the chain letters of the past, when the mood strikes you, you send out a piece of art to someone on the ‘official’ list. Unlike a chain letter, you get to pick and choose the person you send your art to, and there is no obligation to ever send anything. However, I feel compelled to participate (as I should, after all I did sign up). I know that Artist Trading Cards (ATCs) have been around for a long time, but I just recently discovered them. What I got even more excited about is that now you can also purchase a kit of sorts that includes a sleeve, a frame and an envelope for sending them out. What a treat! Our mailing group received a wonderful name—Kikau Mail: to give freely—from fellow CZT, Lois Stokes. To date I have sent out several pieces and this is one of them. Beautiful work! 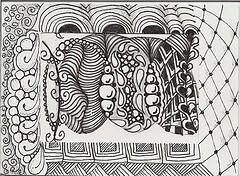 How can I partcipate in the ATC Zentangle group? That’s the card I received and it is so awesome! Your scan doesn’t do it justice.